Tuesday, May the 1st, 1660. King's Letter to General Monck. 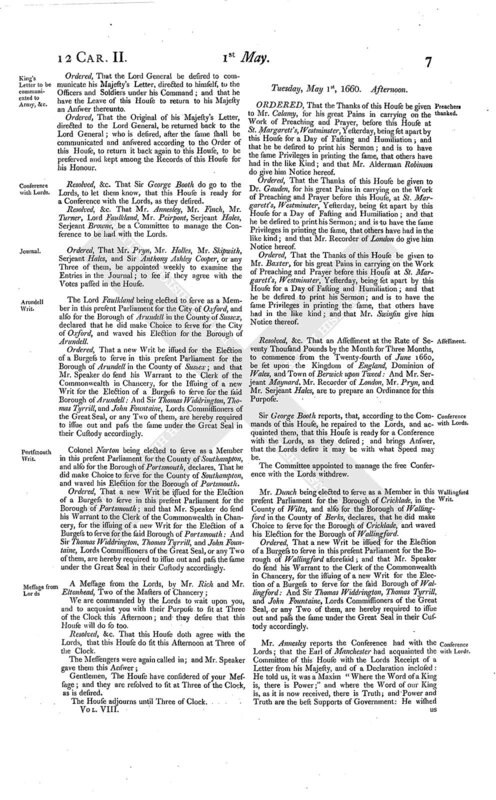 King's Letters, &c. to be printed. King's Letter to be communicated to Army, &c.
Tuesday, May 1st, 1660. Afternoon. MR. Annesley reports from the Council of State a Letter from the King, unopened, directed, "To Our Trusty and Well-beloved General Monck, to be communicated to the President and Council of State, and to the Officers of the Armies under his Command;" being received from the Hands of Sir John Greenvill. Resolved, &c. That Sir John Greenvill, a Messenger from the King, be called in. Mr. Speaker, I am commanded by the King my Master to deliver this Letter to You, and his Desires, that You will communicate it to the House. The Letter was directed, "To Our Trusty and Well-beloved "the Speaker of the House of Commons;" which, after the Messenger was withdrawn, was read to the House by Mr. Speaker. A Declaration from the King, inclosed within the said Letter, was read by the Clerk, given under the King's Sign Manual and Privy Signet, at his Court at Breda, the 4/14 of April 1660, in the Twelfth Year of his Reign. The aforesaid Letter from the King, reported from the Council of State, with a Declaration therein inclosed, agreeing verbatim with the Declaration formerly read, was also read. Mr. Speaker, We are commanded by the Lords to wait on this House with this Message, That the Lords desire a Conference with this House in the Painted Chamber at Eleven of Clock this Day, in order to the Settlement of the great Affairs of the Kingdom. Gentlemen, The House hath considered of your Message; and they will return Answer by Messengers of their own. Resolved, &c. nemine contradicente, That an Answer be prepared to his Majesty's Letter, expressing the great and joyful Sense of this House of his gracious Offers, and their humble and hearty Thanks to his Majesty for the same; and with Professions of their Loyalty and Duty to his Majesty; and that this House will give a speedy Answer to his Majesty's gracious Proposals. Ordered, That it be referred to a Committee to prepare the said Answer. Resolved, &c. That the Number of the Committee be Seven. Ordered, That Mr. Finch, Mr. Ansley, Sir Antho. Ashley Cooper, Lord General, Sir Wm. Lewis, Mr. Morris, and Mr. Hollis, be the Committee. Resolved, &c. nemine contradicente, That the Sum of Fifty thousand Pounds be presented to the King's Majesty from this House. Ordered, That the Committee appointed to draw the Answer to the King's Letter do go to the Lord Mayor, Aldermen, and Commons of the City of London, to consider with them how the said Sum of Fifty thousand Pounds may be raised, what Security they will desire for Repayment thereof, with Interest after the Rate of Six Pounds per Cent. and to offer such Security as they shall think fit, for Repayment thereof to the Persons who shall advance the same. Ordered, That the Aldermen and Burgesses who serve for the City of London, do repair to the Lord Mayor, and desire him, that a Common Council be called To-morrow at Two of the Clock in the Afternoon. Resolved, &c. That it be referred to the same Committee that are appointed to go to the Lord Mayor, Aldermen, and Commons, of the City of London, about the Fifty thousand Pounds, to consider with them about a further Sum to be raised and applied for the paying of the Army, and to consider how the Arrears of the Army may be satisfied. Resolved, &c. nemine contradicente, That the Letters from his Majesty, both that to the House, and that to the Lord General, and his Majesty's Declaration, which came inclosed, be entered at large in the Journal Book of this House. TRUSTY and Well-beloved, We greet you well. In these great and unsupportable Afflictions and Calamities, under which the poor Nation hath been so long exercised, and by which it is so near exhausted, We cannot think of a more natural and proper Remedy, than to resort to those for Counsel and Advice, who have seen and observed the first Beginning of our Miseries, the Progress from bad to worse, and the Mistakes and Misunderstandings which have produced and contributed to Inconveniences which were not intended; and after so many Revolutions, and the Observation of what hath attended them, are now trusted by Our good Subjects to repair the Breaches which are made, and to provide proper Remedies for those Evils, and for the lasting Peace, Happiness, and Security of the Kingdom. We do assure you upon Our Royal Word, that none of Our Predecessors have had a greater Esteem of Parliaments, as We have in Our Judgment, as well as from Our Obligation: We do believe them to be so vital a Part of the Constitution of the Kingdom, and so necessary for the Government of it, that We well know, neither Prince nor People can be in any tolerable Degree happy without them: And therefore you may be confident, We shall always look upon their Counsels, as the best We can receive; and shall be as tender of their Privileges, and as careful to preserve and protect them, as of that which is most near to Our Self, and most necessary for Our own Preservation. And as this is Our Opinion of Parliaments, that their Authority is most necessary for the Government of the Kingdom; so We are most confident, that you believe and find, that the Preservation of the King's Authority is as necessary for the Preservation of Parliaments; and that it is not the Name, but the right Constitution of them, which can prepare and apply proper Remedies for those Evils, which are grievous to the People, and which can thereby establish their Peace and Security: And therefore We have not the least Doubt, but that you will be as tender in, and as jealous of, any thing that may infringe Our Honour, or impair Our Authority, as of your own Liberty and Property; which is best preserved, by preserving the other. How far We have trusted you in this great Affair, and how much it is in your Power to restore the Nation to all that it hath lost; and to redeem it from any Infamy it hath undergone, and to make King and People as happy as they ought to be, you will find by Our inclosed Declaration; a Copy of which We have likewise sent to the House of Peers: And you will easily believe, that We would not voluntarily, and of our Self, have reposed so great a Trust in you, but upon an intire Confidence, that you will not abuse it, and that you will proceed in such a Manner, and with such due Consideration of Us, who have trusted you, that We shall not be ashamed of declining other Assistance, (which We have Assurance of) and repairing to you for more natural and proper Remedies for the Evils We would be freed from, nor sorry, that We have bound up Our own Interest so intirely with that of Our Subjects, as that we refer it to the same Persons to take care of Us, who are trusted to provide for them. We look upon you as wise and dispassionate Men, and good Patriots, who will raise up those Banks and Fences which have been cast down, and who will most reasonably hope, that the same Prosperity will again spring from those Roots from which it hath heretofore and always grown. Nor can We apprehend, that you will propose any thing to Us, or expect any thing from Us, but that we are as ready to give, as you to receive. If you desire the Advancement and Propagation of the Protestant Religion; We have, by our constant Profession and Practice of it, given sufficient Testimony to the World, That neither the Unkindness of those of the same faith towards us, nor the Civilities and Obligations from those of a contrary Profession, (of both which We have had abundant Evidence) could in the least degree startle Us, or make Us swerve from it; and nothing can be proposed to manifest Our Zeal and Affection for it, to which we will not readily consent: And We hope in due Time Our Self to propose somewhat to you for the Propagation of it, that will satisfy the World, that We have always made it both Our Care, and Our Study, and have enough observed what is most like to bring Disadvantage to it. If you desire Security for those who in these Calamitous Times either wilfully or weakly have transgressed those Bounds which were prescribed, and have invaded each others Rights; We have left to you to provide for their Security and Indemnity, and in such a Way as you shall think just and reasonable, and, by a just Computation of what Men have done and suffered, as near as is possible, to take care, that all Men be satisfied; which is the surest Way to suppress and extirpate all such Uncharitableness and Animosity, as might hereafter shake and threaten that Peace which for the present might seem established. If there be a crying Sin, for which the Nation may be involved in the Infamy that attends it; We cannot doubt but that you will be as solicitous to redeem and vindicate the Nation from that Guilt and Infamy, as We can be. If you desire that Reverence and Obedience may be paid to the fundamental Laws of the Lands, and that Justice may be equally and impartially administered to all Men; it is that which We desire to be sworn to Our Self, and that all Persons in Power and Authority should be so too. In a Word, there is nothing that you can propose, that may make the Kingdom happy, which We will not contend with you to compass: And upon this Confidence and Assurance, We have thought fit to send you this Declaration, that you may, as much as is possible at this Distance, see our Heart; which, when God shall bring us nearer together, (as We hope he will do shortly) will appear to you very agreeable to what We have prosessed: And We hope, that We have made that right Christian Use of Our Affliction, and that the Observation and Experience We have had in other Countries hath been such, as that We, and, We hope, all Our Subjects, shall be the better for what We have seen and suffered. We shall add no more, but Our Prayers to Almighty God, that He will so bless your Counsels, and direct your Endeavours, that his Glory and Worship may be provided for; and the Peace, Honour, and Happiness of the Nation, may be established upon those Foundations which can best support it. And so We bid you Farewell. Given at our Court at Breda, this 4/14 th Day of April 1660, in the Twelfth Year of Our Reign. Superscribed, "To Our Trusty and Well-beloved the Speaker of the House of Commons." 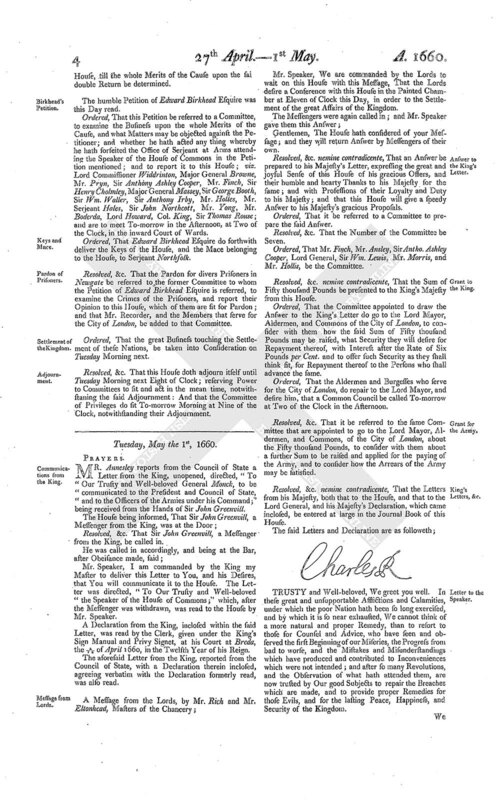 His Majesty's Declaration, which came inclosed in the aforesaid Letter. 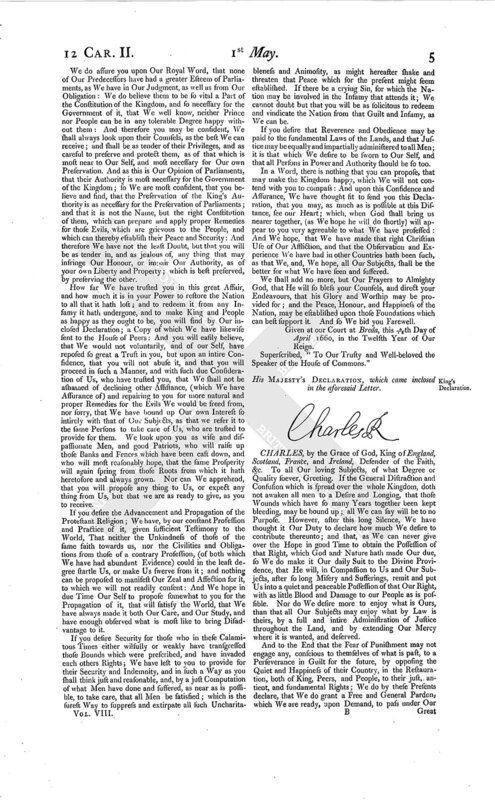 CHARLES, by the Grace of God, King of England, Scotland, France, and Ireland, Defender of the Faith, &c. To all Our loving Subjects, of what Degree or Quality soever, Greeting. If the General Distraction and Confusion which is spread over the whole Kingdom, doth not awaken all men to a Desire and Longing, that those Wounds which have so many Years together been kept bleeding, may be bound up; all We can say will be to no Purpose. However, after this long Silence, We have thought it Our Duty to declare how much We desire to contribute thereunto; and that, as We can never give over the Hope in good Time to obtain the Possession of that Right, which God and Nature hath made Our due, so We do make it Our daily Suit to the Divine Providence, that He will, in Compassion to Us and Our Subjects, after so long Misery and Sufferings, remit and put Us into a quiet and peaceable Possession of that Our Right, with as little Blood and Damage to our People as is possible. Nor do We desire more to enjoy what is Ours, than that all Our Subjects may enjoy what by Law is theirs, by a full and intire Administration of Justice throughout the Land, and by extending Our Mercy where it is wanted, and deserved. And to the End that the Fear of Punishment may not engage any, conscious to themselves of what is past, to a Perseverance in Guilt for the future, by opposing the Quiet and Happiness of their Country, in the Restauration, both of King, Peers, and People, to their just, antient, and fundamental Rights; We do by these Presents declare, that We do grant a Free and General Pardon, which We are ready, upon Demand, to pass under Our Great Seal of England, to all Our Subjects, of what Degree or Quality soever; who, within Forty Days after the publishing hereof, shall lay hold upon this Our Grace and Favour, and shall, by any publick Act, declare their doing so, and that they return to the Loyalty and Obedience of good Subjects; excepting only such Persons as shall hereafter be accepted by Parliament: Those only excepted, let all Our Subjects, how faulty soever, rely upon the Word of a King, solemnly given by this present Declaration, that no Crime whatsoever, committed against Us, or Our Royal Father, before the Publication of this, shall ever rise in Judgment, or be brought in Question, against any of them, to the least Endamagement of them, either in their Lives, Liberties, or Estates, or (as far forth as lies in Our Power) so much as to the Prejudice of their Reputations, by any Reproach or Term of Distinction from the rest of Our best Subjects; We desiring and ordaining, that henceforward all Notes of Discord, Separation, and Difference of Parties be utterly abolished among all Our Subjects; whom We invite and conjure to a perfect Union among themselves under Our Protection, for the Re-settlement of Our just Rights, and theirs in a free Parliament; by which, upon the Word of a King, We will be advised. And, because the Passion and Uncharitableness of the Times have produced several Opinions in Religion, by which Men are engaged in Parties and Animosities against each other, which, when they shall hereafter unite in a Freedom of Conversation, will be composed or better understood; We do declare a Liberty to tender Consciences; and that no Man shall be disquieted or called in Question, for Differences of Opinion in Matter of Religion which do not disturb the Peace of the Kingdom: and that We shall be ready to consent to such an Act of Parliament, as, upon mature Deliberation, shall be offered to Us for the full granting that Indulgence. And because, in the continued Distractions of so many Years and so many and great Revolutions, many Grants and Purchases of Estates have been made to and by many Officers, Soldiers, and others, who are now possessed of the same, and who may be liable to Actions at Law upon several Titles; We are likewise willing, that all such Differences, and all Things relating to such Grants, Sales, and Purchases, shall be determined in Parliament, which can best provide for the just Satisfaction of all Men who are concerned. And We do further declare, That We shall be ready to consent to any Act or Acts of Parliament to the Purposes aforesaid, and to the full Satisfaction of all Arrears due to the Officers and Soldiers of the Army under the Command of General Monck; and that they shall be received into Our Service, upon as good Pay and Conditions, as they now enjoy. Given under Our Sign Manuel, and Privy Signet, at Our Court at Breda, this 4/14 Day of April 1660, in the 12th Year of Our Reign. His Majesty's Letter to General Monck. TRUSTY and Well-beloved, We greet you well. It cannot be believed but that We have been, are, and ever must be, as solicitous as We can, by all Endeavours, to improve the Affections of Our good Subjects at home, and to procure the Assistance of Our Friends and Allies Abroad, for the Recovery of that Right which, by the Laws of God and Man, is unquestionable, and of which We have been so long dispossessed by such Force, and with those Circumstances, as We do not desire to aggravate by any sharp Expressions, but rather with that the Memory of what is past may be buried to the World. That We have more endeavoured to prepare and to improve the Affections of Our Subjects at Home for Our Restoration, than to procure Assistance from Abroad to invade either of Our Kingdoms, is as manifest to the World: And We cannot give a better Evidence, than We are still of the same Mind, than in this Conjuncture, when common Reason must satisfy all Men, that We cannot be without an Assistance from Abroad: We chuse rather to send to You, who have it in your own Power to prevent that Ruin and Desolation which a War would bring upon the Nation, and to make the whole Kingdom owe the Peace, Happiness, Security, and Glory it shall enjoy to your Virtue, and to acknowledge, that your Armies have complied with their Obligations, for which they were first raised, for the Preservation of the Protestant Religion, the Honour and Dignity of the King, the Privileges of Parliament, the Liberty and Property of the Subject, and the fundamental Laws of the Land; and that you have vindicated that Trust, which others most persidiously abused and betrayed. How much We desire and resolve to contribute to those good Ends, will appear to you by Our inclosed Declaration; which We desire you to cause to be published for the Information and Satisfaction of all good Subjects, who do not desire a further Effusion of precious Christian Blood, but to have their Peace and Security founded upon that which can only support it, a Unity of Affections amongst ourselves, an equal Administration of Justice to all Men, restoring Parliaments to a full Capacity of providing for all that is amiss, and the Laws of the Land to their due Veneration. You have been yourselves Witnesses of so many Revolutions, and have had so much Experience how far any Power and Authority, that is only assumed by Passion and Appetite, and not supported by Justice, is from providing for the Peace and Happiness of the People, or from receiving any Obedience from them, without which no Government can provide for them, that you may very reasonably believe, that God hath not been well pleased with the Attempts that have been made, since he hath usually increased the Confusion, by giving all the Success that hath been desired, and brought that to pass without Effect, which the Designers have proposed as the best Means to settle and compose the Nation: And therefore We cannot but hope and believe, that you will concur with Us, in the Remedy We have applied, which, to human Understanding, is only proper for the Ills we all groan under, and that you will make yourselves the blessed Instruments to bring this Blessing of Peace and Reconciliation upon King and People, it being the usual Method in which Divine Providence delighteth itself to use, and sanctify those very Means which ill Men design for the Satisfaction of private and particular Ends and Ambition and other wicked Purposes, to wholsome and publick Ends; and to establish that Good, which is most contrary to the Designers; which is the greatest Manifestation of God's peculiar Kindness to a Nation, that can be given in this World. How far We resolve to preserve your Interests, and to reward your Services, We refer to Our Declaration: And We hope, God will inspire you to perform your Duty to Us, and to your native Country, whose Happiness cannot be separated from each other. We have entrusted Our well-beloved Servant Sir John Greenville, One of the Gentlemen of Our Bed Chamber, to deliver This unto You, and to give Us an Account of your Reception of it, and to desire you, in Our Name, that it may be published. And so We bid You farewell. Given at Our Court at Breda, this 4/14 of April 1660, in the Twelfth Year of Our Reign. Ordered, &c. nemine contradicente, That the Letters from his Majesty, both that to this House, and that to the Lord General, with his Majesty's Declaration, which came inclosed, and the Resolve of this House thereupon, be forthwith printed and published. Ordered, That the Lord General be desired to communicate his Majesty's Letter, directed to himself, to the Officers and Soldiers under his Command; and that he have the Leave of this House to return to his Majesty an Answer thereunto. Ordered, That the Original of his Majesty's Letter, directed to the Lord General, be returned back to the Lord General; who is desired, after the same shall be communicated and answered according to the Order of this House, to return it back again to this House, to be preserved and kept among the Records of this House for his Honour. Resolved, &c. That Sir George Booth do go to the Lords, to let them know, that this House is ready for a Conference with the Lords, as they desired. Resolved, &c. That Mr. Annesley, Mr. Finch, Mr. Turner, Lord Faulkland, Mr. Peirpont, Serjeant Hales, Serjeant Browne, be a Committee to manage the Conference to be had with the Lords. Ordered, That Mr. Pryn, Mr. Holles, Mr. Skipwith, Serjeant Hales, and Sir Anthony Ashley Cooper, or any Three of them, be appointed weekly to examine the Entries in the Journal; to see if they agree with the Votes passed in the House. The Lord Faulkland being elected to serve as a Member in this present Parliament for the City of Oxford, and also for the Borough of Arundell in the County of Sussex, declared that he did make Choice to serve for the City of Oxford, and waved his Election for the Borough of Arundell. Ordered, That a new Writ be issued for the Election of a Burgess to serve in this present Parliament for the Borough of Arundell in the County of Sussex; and that Mr. Speaker do send his Warrant to the Clerk of the Commonwealth in Chancery, for the Issuing of a new Writ for the Election of a Burgess to serve for the said Borough of Arundell: And Sir Thomas Widdrington, Thomas Tyrrill, and John Fountaine, Lords Commissioners of the Great Seal, or any Two of them, are hereby required to issue out and pass the same under the Great Seal in their Custody accordingly. Colonel Norton being elected to serve as a Member in this present Parliament for the County of Southampton, and also for the Borough of Portsmouth, declares, That he did make Choice to serve for the County of Southampton, and waved his Election for the Borough of Portsmouth. 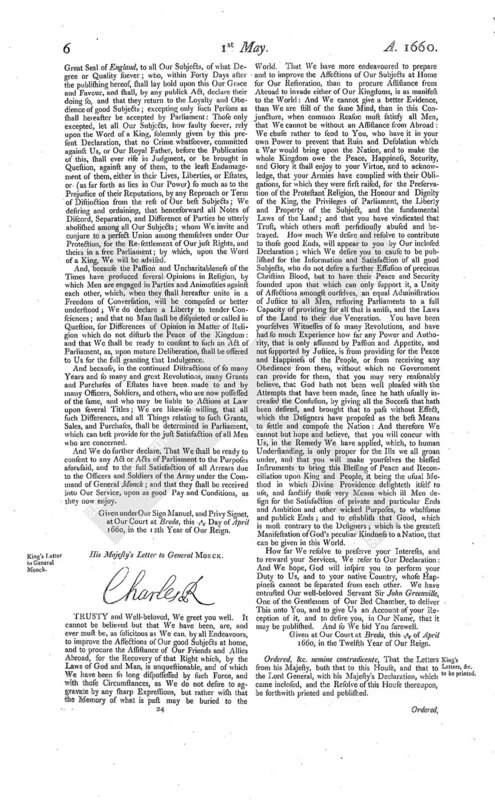 Ordered, That a new Writ be issued for the Election of a Burgess to serve in this present Parliament for the Borough of Portsmouth; and that Mr. Speaker do send his Warrant to the Clerk of the Commonwealth in Chancery, for the issuing of a new Writ for the Election of a Burgess to serve for the said Borough of Portsmouth: And Sir Thomas Widdrington, Thomas Tyrrill, and John Fountaine, Lords Commissioners of the Great Seal, or any Two of them, are hereby required to issue out and pass the same under the Great Seal in their Custody accordingly. We are commanded by the Lords to wait upon you, and to acquaint you with their Purpose to sit at Three of the Clock this Afternoon; and they desire that this House will do so too. Resolved, &c. That this House doth agree with the Lords, that this House do sit this Afternoon at Three of the Clock. Gentlemen, The House have considered of your Message; and they are resolved to sit at Three of the Clock, as is desired. The House adjourns until Three of Clock. ORDERED, That the Thanks of this House be given to Mr. Calamy, for his great Pains in carrying on the Work of Preaching and Prayer, before this House at St. Margarett's, Westminster, Yesterday, being set apart by this House for a Day of Fasting and Humiliation; and that he be desired to print his Sermon; and is to have the same Privileges in printing the same, that others have had in the like Kind; and that Mr. Alderman Robinson do give him Notice hereof. Ordered, That the Thanks of this House be given to Dr. Gauden, for his great Pains in carrying on the Work of Preaching and Prayer before this House, at St. Margarett's, Westminster, Yesterday, being set apart by this House for a Day of Fasting and Humiliation; and that he be desired to print his Sermon; and is to have the same Privileges in printing the same, that others have had in the like kind; and that Mr. Recorder of London do give him Notice hereof. Ordered, That the Thanks of this House be given to Mr. Baxter, for his great Pains in carrying on the Work of Preaching and Prayer before this House at St. Margarett's, Westminster, Yesterday, being set apart by this House for a Day of Fasting and Humiliation; and that he be desired to print his Sermon; and is to have the same Privileges in printing the same, that others have had in the like kind; and that Mr. Swinfin give him Notice thereof. Resolved, &c. That an Assessment at the Rate of Seventy Thousand Pounds by the Month for Three Months, to commence from the Twenty-fourth of June 1660, be set upon the Kingdom of England, Dominion of Wales, and Town of Berwick upon Tweed: And Mr. Serjeant Maynard, Mr. Recorder of London, Mr. Pryn, and Mr. Serjeant Hales, are to prepare an Ordinance for this Purpose. Sir George Booth reports, that, according to the Commands of this House, he repaired to the Lords, and acquainted them, that this House is ready for a Conference with the Lords, as they desired; and brings Answer, that the Lords desire it may be with what Speed may be. The Committee appointed to manage the free Conference with the Lords withdrew. Mr. Dunch being elected to serve as a Member in this present Parliament for the Borough of Cricklade, in the County of Wilts, and also for the Borough of Wallingford in the County of Berks, declares, that he did make Choice to serve for the Borough of Cricklade, and waved his Election for the Borough of Wallingford. Ordered, That a new Writ be issued for the Election of a Burgess to serve in this present Parliament for the Borough of Wallingford aforesaid; and that Mr. Speaker do send his Warrant to the Clerk of the Commonwealth in Chancery, for the issuing of a new Writ for the Election of a Burgess to serve for the said Borough of Wallingford: And Sir Thomas Widdrington, Thomas Tyrrill, and John Fountaine, Lords Commissioners of the Great Seal, or any Two of them, are hereby required to issue out and pass the same under the Great Seal in their Custody accordingly. 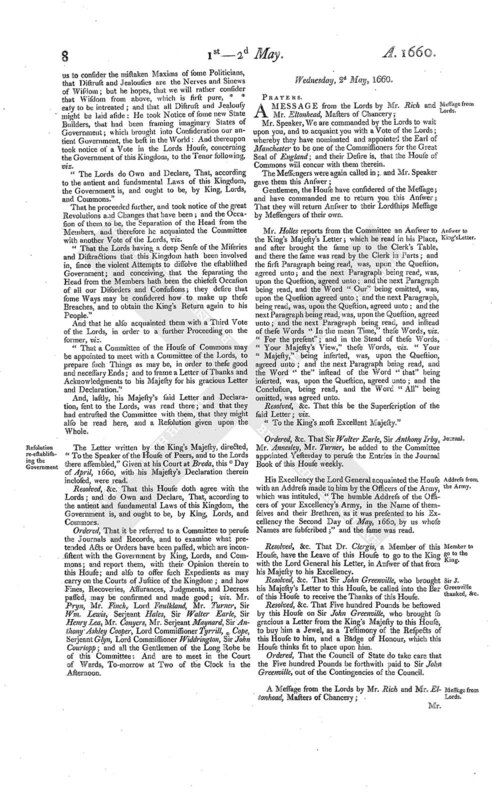 Mr. Annesley reports the Conference had with the Lords; that the Earl of Manchester had acquainted the Committee of this House with the Lords Receipt of a Letter from his Majesty, and of a Declaration inclosed: He told us, it was a Maxim "Where the Word of a King is, there is Power;" and where the Word of our King is, as it is now received, there is Truth; and Power and Truth are the best Supports of Government: He wished us to consider the mistaken Maxims of some Politicians, that Distrust and Jealousies are the Nerves and Sinews of Wisdom; but he hopes, that we will rather consider that Wisdom from above, which is first pure, * * easy to be intreated; and that all Distrust and Jealousy might be laid aside: He took Notice of some new State Builders, that had been framing imaginary States of Government; which brought into Consideration our antient Government, the best in the World: And thereupon took notice of a Vote in the Lords House, concerning the Government of this Kingdom, to the Tenor following, viz. "The Lords do Own and Declare, That, according to the antient and fundamental Laws of this Kingdom, the Government is, and ought to be, by King, Lords, and Commons." That he proceeded further, and took notice of the great Revolutions and Changes that have been; and the Occasion of them to be, the Separation of the Head from the Members, and therefore he acquainted the Committee with another Vote of the Lords, viz. "That the Lords having a deep Sense of the Miseries and Distractions that this Kingdom hath been involved in, since the violent Attempts to dissolve the established Government; and conceiving, that the separating the Head from the Members hath been the chiefest Occasion of all our Disorders and Confusions; they desire that some Ways may be considered how to make up these Breaches, and to obtain the King's Return again to his People." And that he also acquainted them with a Third Vote of the Lords, in order to a further Proceeding on the former, viz. "That a Committee of the House of Commons may be appointed to meet with a Committee of the Lords, to prepare such Things as may be, in order to these good and necessary Ends; and to frame a Letter of Thanks and Acknowledgments to his Majesty for his gracious Letter and Declaration." And, lastly, his Majesty's said Letter and Declaration, sent to the Lords, was read there; and that they had entrusted the Committee with them, that they might also be read here, and a Resolution given upon the Whole. Ordered, That it be referred to a Committee to peruse the Journals and Records, and to examine what pretended Acts or Orders have been passed, which are inconsistent with the Government by King, Lords, and Commons; and report them, with their Opinion therein to this House; and also to offer such Expedients as may carry on the Courts of Justice of the Kingdom; and how Fines, Recoveries, Assurances, Judgments, and Decrees passed, may be confirmed and made good; viz. Mr. Pryn, Mr. Finch, Lord Faulkland, Mr. Turner, Sir Wm. Lewis, Serjeant Hales, Sir Walter Earle, Sir Henry Lea, Mr. Conyers, Mr. Serjeant Maynard, Sir Anthony Ashley Cooper, Lord Commissioner Tyrrill, * Cope, Serjeant Glyn, Lord Commissioner Widdrington, Sir John Courtopp; and all the Gentlemen of the Long Robe be of this Committee: And are to meet in the Court of Wards, To-morrow at Two of the Clock in the Afternoon.